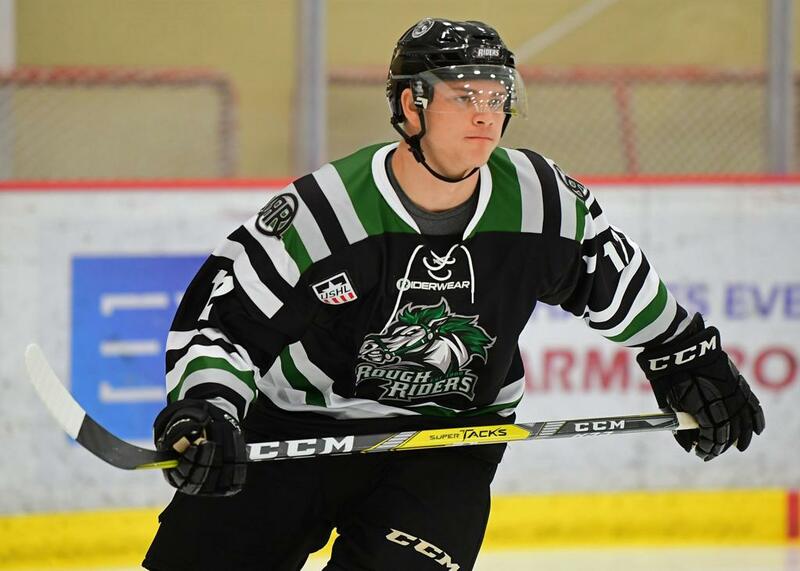 Jon Rogger had high expectations when he learned that Samir Abouelhana was returning to his Philadelphia Revolution team for one more season in the Eastern Hockey League. “I think his hockey sense is D-I caliber, and we were very fortunate to have him in Philadelphia,” said Rogger, the team’s head coach. “It didn’t surprise me when he said he was coming back that he would lead the league in scoring and become the MVP. Abouelhana was among those honored when the EHL held its first Banquet of Champions and Awards Show before starting its Frozen Four in Providence, R.I. The forward from St. Louis, who will turn 21 on April 2, was a dominant scorer in the EHL. He finished with league highs of 64 assists and 93 points in 44 games. Abouelhana made an impact beyond his point totals, as was reflected in his selection as the MVP. Abouelhana had five game-winning goals, five power-play goals and three short-handed goals. He also had 20 assists when the Revolution was on the power play. “When he’s on the power play, he can control a game by himself,” Rogger said. “When you’re playing against a player like that, everybody knows when he’s on the ice. The Philadelphia Little Flyers had Mikey Giampapa named Forward of the Year and Brendahn Brawley Goalie of the Year. Giampapa had 29 goals and 25 assists in 35 regular-season games. The 18-year-old from Ridley, Pa., then added three goals and an assist in the playoffs as the Little Flyers finished second. Brawley went 24-3-1 with a 1.77 goals-against average and .940 save percentage. The 20-year-old from Morton, Pa., put up similar postseason numbers with a 1.87 GAA and .936 save percentage. The other year-ending awards went to: Defenseman, Niks Krollis, New Hampshire Avalanche; Coach, Bill Zaniboni, Seahawks Hockey Club; and Rookie, Dominiks Marcinkevics, New England Wolves. Krollis had 10 goals and 23 assists in 27 regular-season games, then scored goals in all three Frozen Four round-robin games for the league champions. Marcinkevics had 34 goals and 27 assists in 42 games. The league-champion Avalanche had half of the six spots on the New England Conference first-team all-stars. Forwards Wiggle Kerbrat and Jake Adkins joined Krollis. Marcinkevics was the other forward. Corey Doney from the Vermont Lumberjacks was the other defenseman, and D.J. Paxson from the Seahawks was the goalie. Brawley and Giampapa were two of four Little Flyers on the Mid-Atlantic Conference first team. They were joined by defensemen Nick Daluisio and Zikmund Mroz. Abouelhana and Anthony Starzi from the Wilkes-Barre/Scranton Knights were the other forwards.